Multi-expressional emoji Gene sets out on a journey to become a normal emoji. • Audio Commentary with Writer/Director Tony Leondis, Head of Story Mark Sperber, Production Designer Carlos Zaragoza, and Head of Layout James Williams. In a world where cell phones dominate our culture, I guess it makes sense that Hollywood would capitalize on their ubiquity. 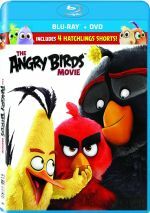 In 2016, The Angry Birds Movie brought us a tale based on an app, and 2017’s The Emoji Movie goes one step further, as it explores the world of those little emotion-related characters we use for texts. The story takes place in Textopolis, a location where the emojis live. When called upon by cell phone users, they have to perform their duties to connote expressions. While all the other emojis only boast one emotional dimension, “meh” emoji Gene (voiced by TJ Miller) can display an array of faces. This makes him an outcast and he attempts to deal with his status. Due to the perspective it takes, I admit that storyline surprises me. One would expect Emoji to take the opposite path and feature a one-dimensional character who aspires to more expressiveness. Instead, Gene comes across like a gay kid who tries to repress his sexuality – and one who pursues conversion therapy! Of course, it comes as no shock that Gene eventually accepts/embraces his true self, but the film feels oddly regressive most of the time. Even without that strangely backward-looking plot, Emoji lacks much to make it work. On the positive side, the film does come with a good cast, as in addition to Miller, we find actors such as Steven Wright, Maya Rudolph, Jennifer Coolidge, Patrick Stewart, James Corden, Anna Faris, Sofia Vergara and others. Too bad Emoji wastes the performers with forgettable roles. The actors do their best to make their characters interesting, but the film’s inherent lack of substance renders their efforts for naught. One issue comes from the relentlessly imitative nature of Emoji. It feels like a tale cobbled together from the influence of many other movies - Wreck-It Ralph becomes an obvious template, but plenty of other animated flicks got thrown into this uncreative stew as well. Emoji also fails to deliver a particularly coherent tale. Instead, it largely presents a random collection of gags based on apps and other cell phone functions, few of which connect. I don’t think Emoji lacks any form of cleverness, but it seems too desperate and without substance to satisfy. Packed with clichés and cheap jokes, the movie sputters. Footnote: a short character snippet shows up in the middle of the end credits. 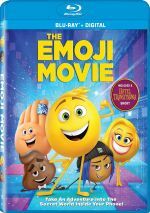 The Emoji Movie appears in an aspect ratio of approximately 2.39:1 on this Blu-ray Disc. While attractive, this wasn’t one of the better-looking animated Blu-rays I’ve seen. Sharpness could be a minor distraction. Though most of the movie displayed solid clarity, a few shots seemed a smidgen soft. These were mild instances, but parts of the image lacked the tightness I expect from Blu-ray. At least no issues with jaggies or shimmering occurred, and edge haloes were absent. Of course, the image lacked any print flaws; it remained clean at all times. Colors became a strong element, as the movie went with a somewhat pastel palette, and it displayed consistently vivid hues. Blacks were dense and tight, and shadows were fine. Overall, this was a good enough presentation for a “B+”, but the presentation disappointed compared to the usual “A”-level computer animated effort. As expected, the film’s occasional action sequences boasted nice breadth and activity. While the soundscape didn’t stun us on a constant basis, it provided more than enough to succeed. Audio quality seemed consistently solid. Speech appeared natural and distinctive; no edginess or other issues marred the dialogue. Music sounded warm and full, while effects showed good clarity and accuracy. When necessary, bass response came across as deep and tight. All of this lifted the track to “B+” status. As we shift to extras, we launch with an audio commentary from writer/director Tony Leondis, head of story Mark Sperber, production designer Carlos Zaragoza, and head of layout James Williams. All four sit together for a running, screen-specific look at story/characters, cast and performances, visual design, cinematography and animation. Overall this becomes a peppy little chat. At times it delves too much into happy talk, but we get a fairly good overview of different production elements. Those help this turn into largely likable track. A new animated short called Puppy! appears next. It runs five minutes and comes from the Hotel Transylvania universe. The cartoon uses Adam Sandler and other actors from the movie series, a fact that gives it more zing. Otherwise, it’s pretty forgettable and exists mainly to promote the next Hotel film. With Jailbreak Decoded: The Untold Story, we find a one-minute, 56-second deleted scene. Presented as a storyreel, it offers a little backstory for the Jailbreak character. It provides a decent bit of exposition but doesn’t add a ton to the role. The song “Good Vibrations” gets two features: a Dance Along (2:38) and a Lyric Video (3:49). The former shows two kids as they demonstrate Gene’s dance, while the latter combines the song with movie shots and text. Neither adds much. A game called Gimme A Hand! actually runs as a five-minute, 37-second featurette. In it, we see two kids try to name emojis that appear on screen. This seems like an odd presentation and it doesn’t entertain. Two How to Draw tutorials appear. Character Andy Bialk teaches us how to sketch Poop (3:35) and Gene (3:17). These clips give us mildly interesting lessons. A featurette called Meet the Cast goes for six minutes, 45 seconds and offers notes from Leondis and actors TJ Miller, Anna Faris, Maya Rudolph, Patrick Stewart, Sofia Vergara, Christina Aguilera and Jake T. Austin. As expected, it looks at cast and characters. I like the handful of shots from the recording booth, but the content lacks substance. During the six-minute, 24-second Sweet App-etite, we learn how to “make your own Candy Crush Saga cake”. Hi-5 narrates as we walk through methods to decorate a cake ala Candy Crush. It’s another forgettable piece – and the guy who subs for James Corden as Hi-5 doesn’t cut it. He shows up for “Hand!” as well and he’s awful. Girls Can Code! fills five minutes, 40 seconds and offers an intro from Faris before we meet a mix of young coders and their teachers. I know the show comes with good intentions, but it seems condescending – its attempt to bolster girls in technology instead comes across as patronizing. After this we find Choreographing Emoji, a three-minute, 33-second piece with Leondis and choreographer Matt Steffanina. We get minor notes about challenges related to the concept of dancing emojis. Though we find a couple of decent facts, the program is too short to tell us much. Creating the World Inside Your Phone takes up four minutes, 38 seconds and involves Leondis, Zaragoza, and Williams. They offer info about issues related to the movie’s sets. Despite the clips’ brevity, it provides some good material and becomes one of the disc’s few useful featurettes. With Bringing Emojis to Life, we locate a three-minute, 22-second reel with Leondis, Zaragoza, Williams and visual effects supervisor Dave Smith. As expected, it delivers some details about character design. Like “World”, it works pretty well. The disc opens with ads for The Star, Hotel Transylvania: The Series, Jumanji: Welcome to the Jungle, The Swan Princess and Smurfs: The Lost Village. 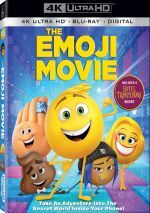 While not the cinematic abomination many expected, The Emoji Movie never becomes an entertaining effort. It lacks real wit or cleverness, as it simply cobbles together a tiresome tale with easy jokes along the way. The Blu-ray provides largely good picture and audio as well as a large but spotty collection of supplements. Emoji becomes a forgettable animated film.